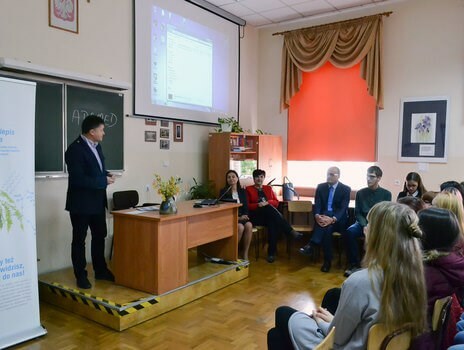 On 17 October, a meeting with Katarzyna Dubno, Management Board Member of the Adamed Group Foundation, and the laureates of the 2nd edition of the ADAMED SmartUP programme, was held in the Stanisław Konarski High School No. 1 in Rzeszów. It was organised at the initiative of the MP Krystyna Wróblewska, member of the Committee on Education, Science and Youth. During her speech, Katarzyna Dubno drew attention to the large number of talented students attending Polish schools who have the chance to significantly develop their interests – both at home and abroad – thanks to the ADAMED SmartUP programme. She emphasised that the Adamed Group Foundation undertakes the effort to raise the future Polish scientific elite, enable their development and stimulate their scientific interests. Adamed has always been connected with science and was based on its own scientific ideas and patents. “We readily share with others the knowledge we have gained over the years,” emphasised Katarzyna Dubno. She also discussed the competition organised to celebrate the 30th anniversary of the Adamed Group, called “30 laboratories for Adamed’s 30th anniversary”, which ended on 30th September. Thirty schools from across Poland were given PLN 10,000 Polish to buy high-tech equipment for their chemical, biological and physical laboratories. The competition has proven that our country does not lack creative youth with an out-of-the-box approach towards science. Jaromir Hunia and Małgorzata Róg from Podkarpacie, the laureates of the 2nd edition of the ADAMED SmartUP programme, encouraged their peers to join the programme. They also spoke about their achievements up to now, experiences with participating in the programme and the opportunities it gave them. According to them, the programme ‘gives wings’ and teaches many practical issues.